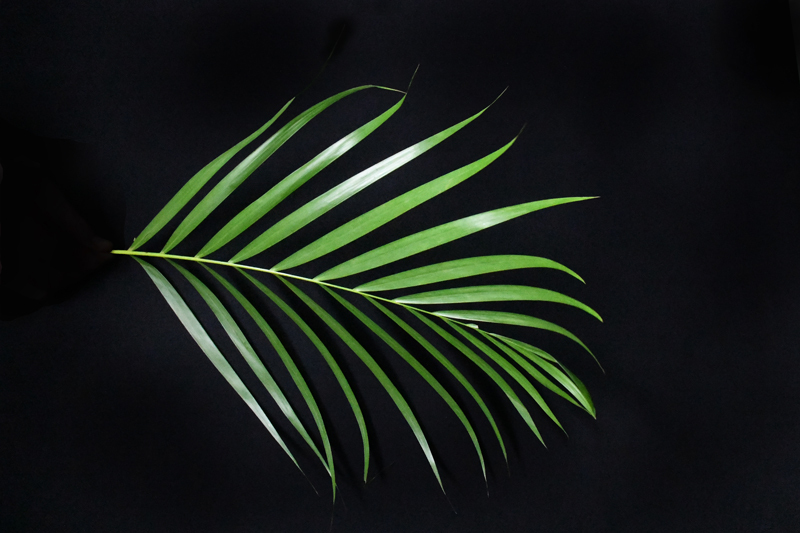 In this tutorial, we use the source imagery (lilies and palm fronds) created in the last episode, S1. EP5. to design and build a series of professional, full-repeat, digital prints in Adobe Photoshop. First, we’ll import our source imagery into Adobe Photoshop and add them to a new print document. 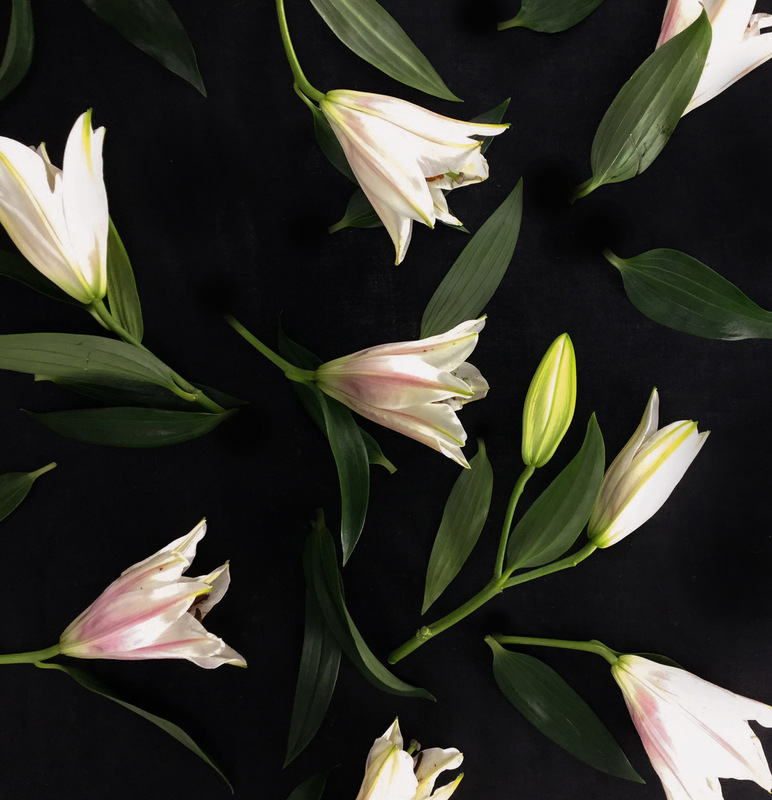 We’ll then scale, arrange and transform the flowers (source imagery) into an aesthetically pleasing print layout. Next, we slice the print layout up to create a full repeat print and then explore the use of filters, hue, saturation and colour layers to create the finished textile print. Finally, we’ll show you how to resize the finished print and save it ready to be digitally printed onto a textile that suits the project and Francesca’s robe. To follow this tutorial you will need Adobe Photoshop CC and you must download our “Selected source images” pack. You can also visit our previous tutorial to get your hands on even more source imagery! Creating your own textile prints can seem pretty daunting. It’s a job or skill in itself and people are paid a lot of money to create textile prints for commercial projects. 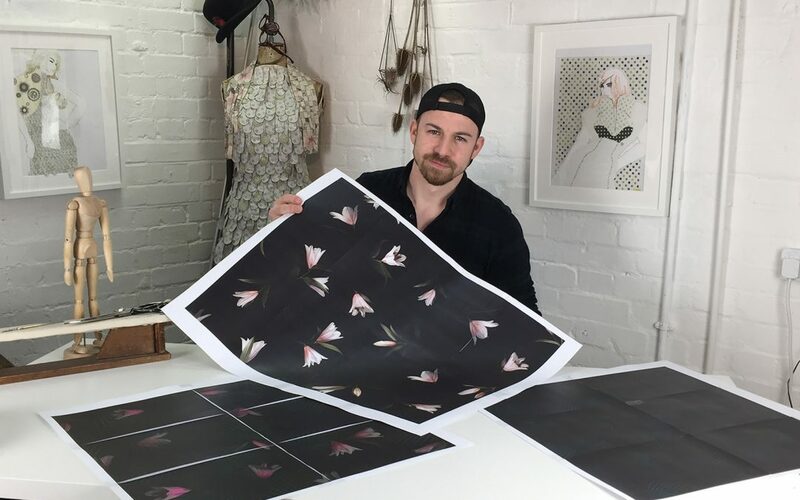 I was a print designer for many years before we launched PatternLab and created 900+ prints for both individual clients and high street retailers. It’s a wonderfully creative job that can be very rewarding, especially when you see your textile print used to make a gorgeous garment. Creating your own textile prints might seem unattainable at first glance, but the process is actually quite simple. This tutorial aims to give you an insight into how textile prints are created in Adobe Photoshop so you can then develop your own. This tutorial focuses on the key tools, processes and creative concepts behind print design. Once you have insight into these tools and processes, the only limitation is your own imagination or creativity. We’ve broken the tutorial up into several key steps or stages. This would be a very long blog post if went into detail for each step, so instead we have provided a little excerpt of what you can expect to learn in each step. 1. Selecting your source imagery. In S1. EP5. we created over 200 source images of our lilies and palm fronds. This is quite a lot and we can’t use every single image in our textile print. We need to whittle it down to around 20 – 25 images and select only the most aesthetically pleasing imagery. Once we have selected our final source images, they are added to a folder on our desktop so they are easy to find and use. You can download our final selection of source imagery by either clicking one of the images below or using the download button. The pack contains all 23 source images used in this tutorial. Once we have selected our source images, we open up Photoshop and create a new document roughly 60 x 60cm and with a resolution of 360dpi (dots per inch). Next, we open our source images in Photoshop and cut (using the magic wand tool) and paste each flower into the new document. Finally, we start to scale, rotate and arrange them (using the free transform tool) into an aesthetically pleasing print layout. 3. Creating a full repeat print. Once we have a beautiful print layout, we need to transform it into a full repeat print. We do this by cutting the print layout in two pieces. An upper piece and a lower piece. We then swap these pieces, so the existing lower piece now sits at the top of the print and the existing upper piece now sits at the bottom of the print. This rearranging of the upper and lower pieces creates a vertical repeat. To create a horizontal repeat, we use the same technique, but this time swapping the right piece with the left piece. We then add or reposition the flowers in the middle of the print to close up any large gaps that might have appeared after rearranging the pieces. Once the full repeat print is created, we can start to get creative. 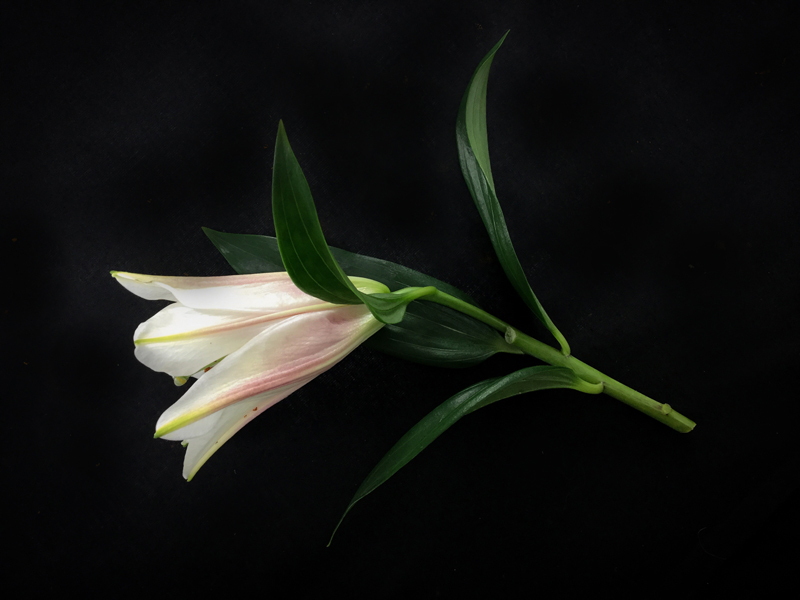 We enhance or mute the natural colours of the flowers using the Hue & Saturation tool to create a more classic style. We then add some additional colour layers and paint effects to create hyper-real or dramatic colour effects over the underlying flowers. 5. Using filters to dramatically change the original print. 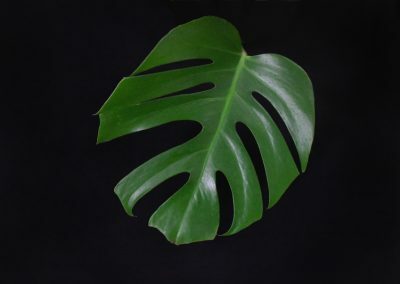 Adobe photoshop comes with an extensive range of filters (found in the filter gallery) that when applied dramatically change the aesthetics of the original print. Filters include, watercolour, glowing edges, poster edges, grain and much more. These filters can be used individually for subtle changes or in combination to create greater changes to the print. The effects of each filter vary and hundreds of different prints can be created using these filters alone. It’s possibly the most interesting and creative part of the print design process. We also discuss what effect image size and resolution has on these filters. We’ve focused on creating a repeat print using just the lilies or flowers, but how do we add a new palm frond layer beneath the lily layer? 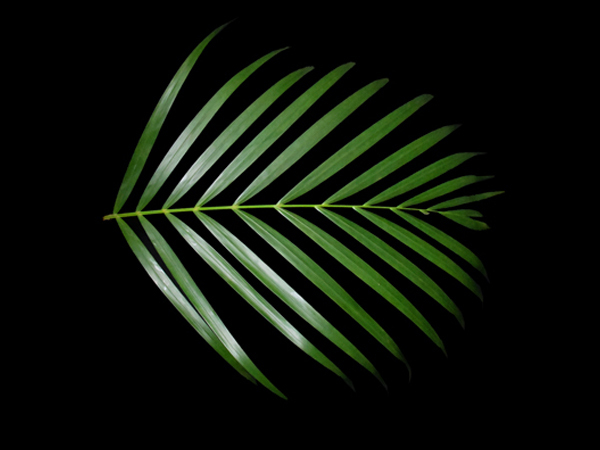 Using the same technique in steps 2 and 3, we create a fully repeating palm frond print in a separate document. 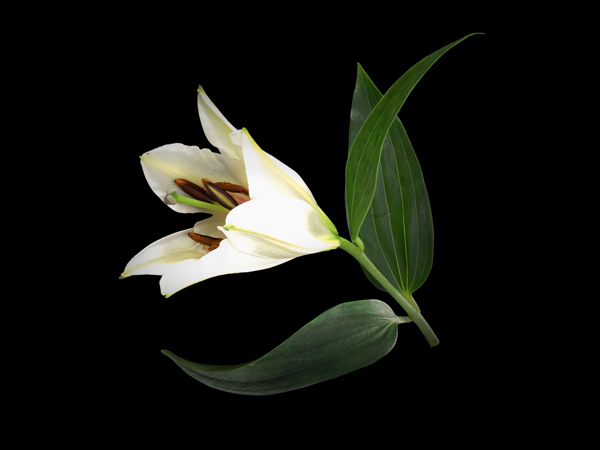 We then cut and paste it into our lily print, resizing it to fit the existing lily repeat using the free transform tool. Once the palm layer is in place we can then enhance it by changing the hue and saturation and adding yet more colour layers (step 4). This creates a more dynamic print and gives us more to experiment with. Once the colour layers have been added we can then apply a range of filters to further develop the entire print. Once we have created our finished print, we need to check the scale of the print. We do this, by printing a section of the print on our home printer at 100% scale (not scale to fit). This will give us the exact size of our print and the size of the elements within it. We can then reduce or increase the image size of the print, in Adobe Photoshop, to get the correct scale or size. We also need to check the colour and brightness of our print since a computer screen is not always accurate. To do this, we use the same technique. We print, check and if necessary adjust the exposure or brightness of the print in Adobe photoshop. When it comes to the colour and brightness of your print, your computer screen and printer might not always be correct. It’s essential to send a test strip containing your print, in a range of different brightness/ colours, to the textile printers. When the strip comes back, you can then select the specific print with the brightness/ colour that works best and use that print when requesting the full material order. 8. File type, size and resolution of your finished print. Saving your print as a file seems pretty straight forward but we need to consider the file type, size and resolution. Each textile print company will have their own specifications. We have chosen to use Spoon Flower as we’ve heard great things! They specifically ask that you save your print in one of the following formats: png, jpeg, giff or tiff. They also ask that the file be less than 40MB and has a resolution of 150dpi max. Creating prints can be a time consuming process, especially when you are new to Adobe Photoshop. To help speed things up, we have created a few important artworks for you to use when following this tutorial. Each print artwork was created at important key stages in the design process. Downloading and using these artworks will enable you to practise or experiment with each stage of the tutorial. Lilies on black background in full repeat with no colour layers or filters. 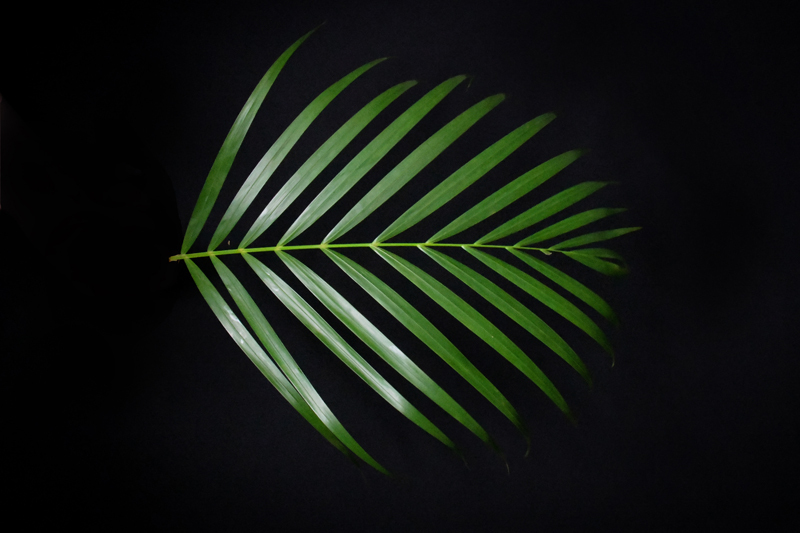 Palm fronds on black background in full repeat with no colour layers or filters. Lilies and palm fronds on black background in full repeat with no colour layers or filters. 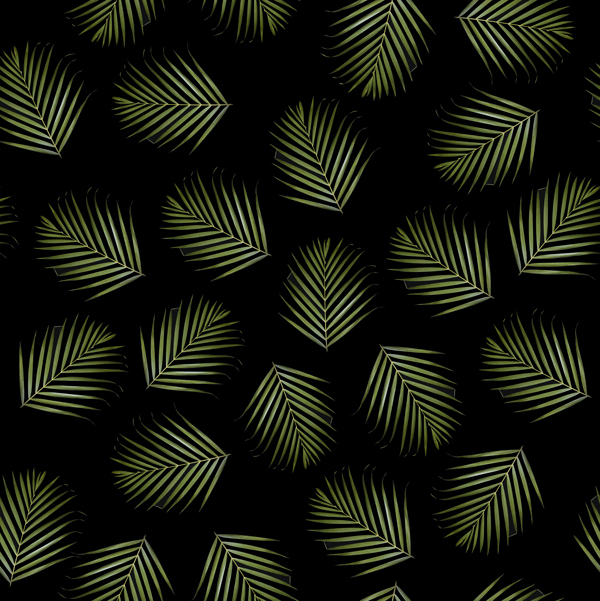 Lillies and palm fronds on black background in full repeat with multiple colour layers but no filters. After an hour two of experimenting with various colour layers and filters, here are a few of the textile prints that we came up with. Next, we’ll add them to our mood boards and fashion illustrations of Francesca’s robe and present them to her for review. Once she’s picked her favourites we’ll use PatternLab’s made to measure basic blocks and patterns to pattern make the finished garment! Want to print your digital prints in full scale and full repeat on your home printer? Use our Textile print templates to create multi-page PDFs which can be stuck together after printing. In this episode, we show you how to create your very own source imagery or stock imagery, allowing you to design and create fashion or textile prints. We show you how to set up your workspace, what lighting to use, which camera does the job and how to get the best shots of your flowers or subject matter. We also show you how to colour-correct your source imagery in Adobe Lightroom, ready to create your gorgeous textile prints in Adobe Photoshop. In the previous two episodes (EP3 and EP4), we designed a range of garments based on Francesca’s initial brief and inspirational imagery. Now that we have a collection of designs that suits the brief, we need to think about the material used to make the garment. From the very beginning of this project, we decided to create some gorgeous custom prints to match Francesca’s personality and compliment her skin tone. We even created a set of mood boards to inspire us as to what her prints might eventually look like. With these inspirational images in mind, we now start the process of designing and creating our own print. To do this, we first need to find or create the source imagery used to create our print. Source imagery or stock imagery can be anything from graphics, illustrations, paintings, images, motifs – you name it! Essentially, they are the individual elements that go into building your finished print. You can either find this stock imagery online or create it yourself. There are a number of stock image sites online, such as iStock photo, Pexels, Shutterstock, Getty images, Adobe stock, Pixabay and Negative space. 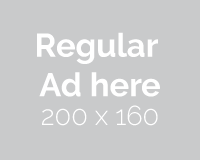 Using stock imagery can be quite expensive, since most sites use licensing and charge a premium for each image. This is used to fund their services and the artists that provide the images. Finding the right stock imagery or elements to create your print can be time consuming and you’ll never get exactly what you are looking for. It’s often quicker to create your own! We highly recommend creating your own stock imagery. It’s a fun process that doesn’t break the bank or take too long and it provides hundreds of images that you can share and use for other print projects. We know some print designers that have vast personal libraries of their own stock imagery that they use time and time again when creating new prints for clients. Also, it’s completely free! 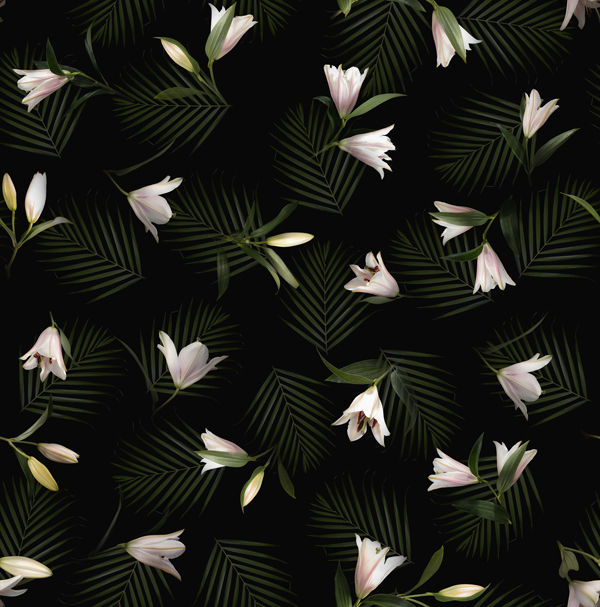 For this particular print project, we’ve decided to go for a gorgeous dark background with tropical palm fronds as a base and then feature a top layer of stunning pink oriental lilies. To create this effect we need to create source imagery for both the palm fronds and the lilies. We’re using a dark background, so it makes sense to also take photos of our lilies and palm fronds on a dark background. 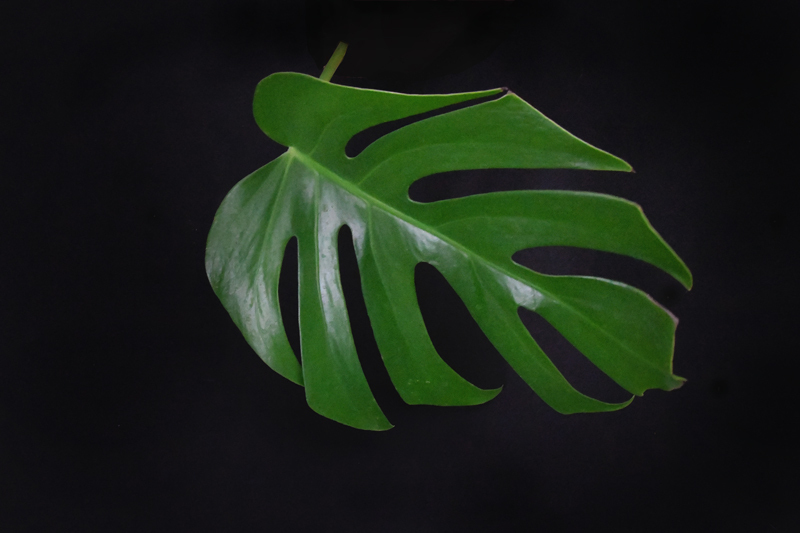 Using a dark background will give us images that are as close to the finished print aesthetics as possible. The dark background will also change the lighting that we apply to the photo shoot. 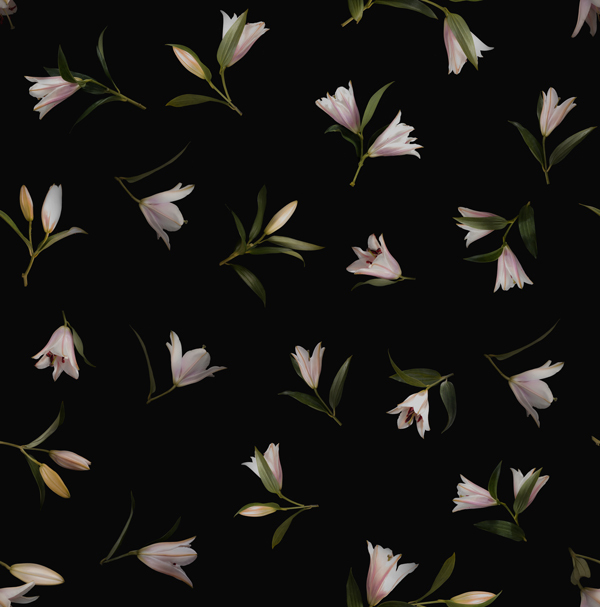 If we used a white background, we would have to cut the flowers out in Photoshop and then place them on a new digital background. This is time consuming and will give bad results. We’ve gone for a matt-black cotton rather than satin to limit the amount of shine reflecting off the material from either the camera’s flash or the natural light in the room. The matt-black cotton absorbs the light rather than reflecting it, which creates a great background for our source imagery. When taking any photo, it’s really important to have a lot of natural light. The more natural light you have the sharper and brighter you images will be. 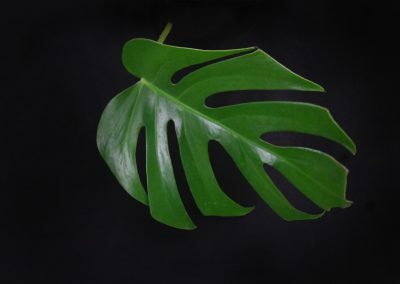 Photos taken in low-light environments will have a lot of shadow and cause grain to appear on them. Too little light and your images might be unusable. You might prefer to use a DSLR camera when taking your photos. That’s fine and you’ll probably get better results. However, not everyone has a DSLR so we’ve chosen to take our pictures using an iPad or iPhone. Camera phones these days take pretty amazing photos, so you should be fine! 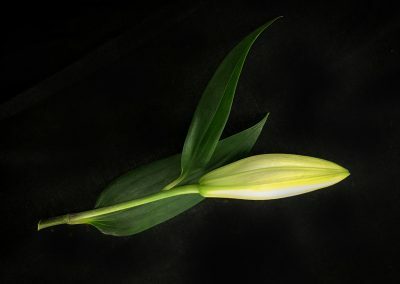 We bought one bunch of lilies, which was more than enough to create hundreds of images. 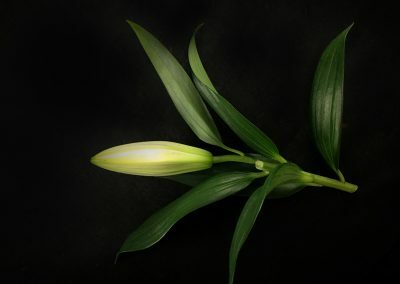 Lilies take days to bloom, so use this life cycle for your photos. Take images when the lilies are closed, partially open and then fully open. This will give you tons of imagery of your one bunch, making it seem as though you raided a florist’s shop. Just remember to use the same lighting, camera and setup each time you take your photos! Positioning your flowers or lilies is key. Think about the angle from which you take your photo. 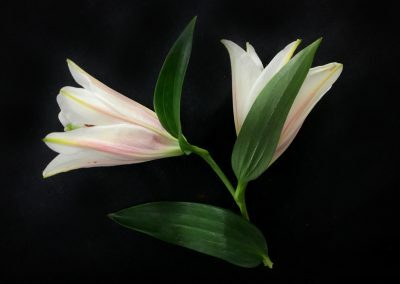 Which angle shows off your lily to its fullest? 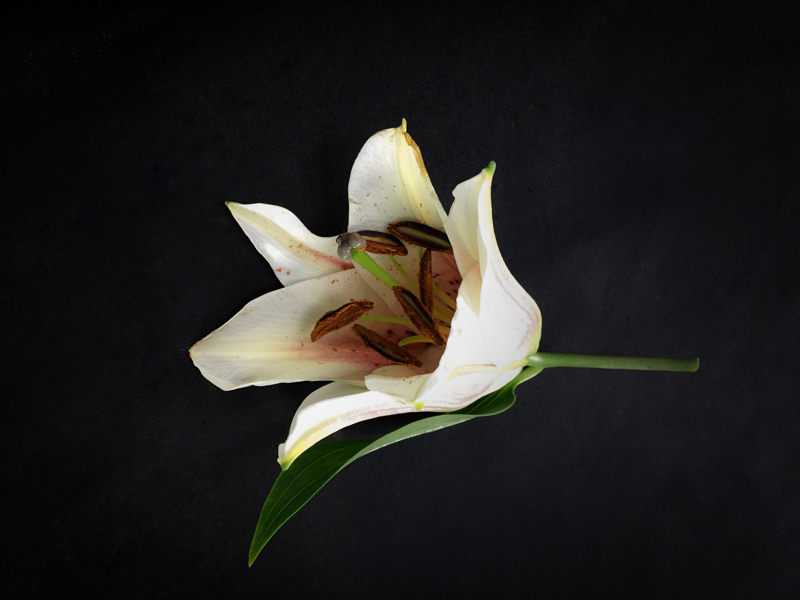 If necessary, you can ask someone to wear a black glove (matching your background) and rotate the lilies as you take your photos. Don’t just take them from the side view, look into the flower itself. Also, think about the positioning in the frame or viewfinder of your camera. 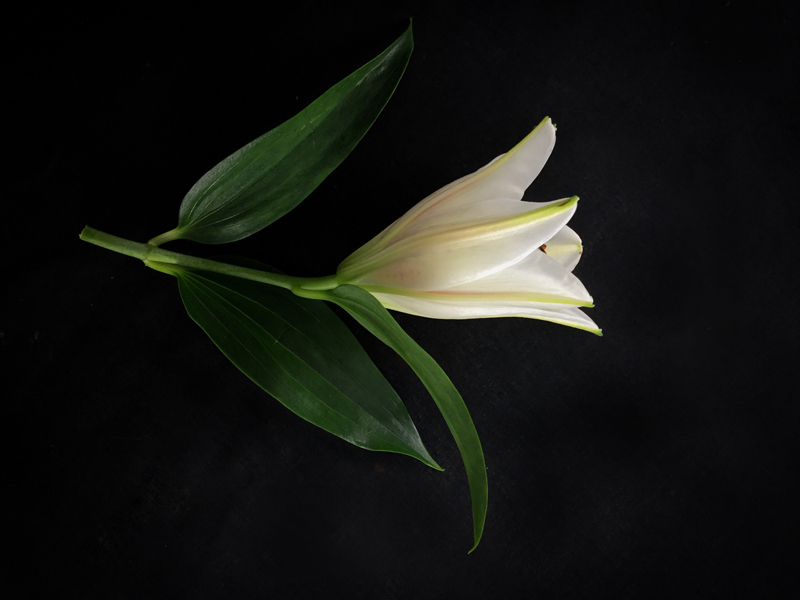 Ideally, you want your lilies to be dead centre, fully in shot and have plenty of black background around them. Petals and leaves that fall outside of the photo will make your source imagery unusable. Define what you want your source imagery to look like! 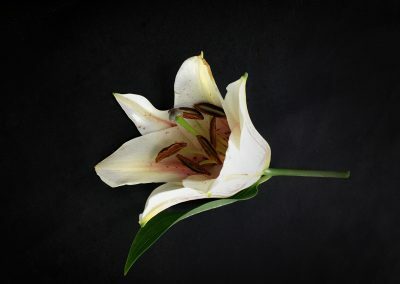 The lilies are beautiful as they come but sometimes we want a specific look or shape. 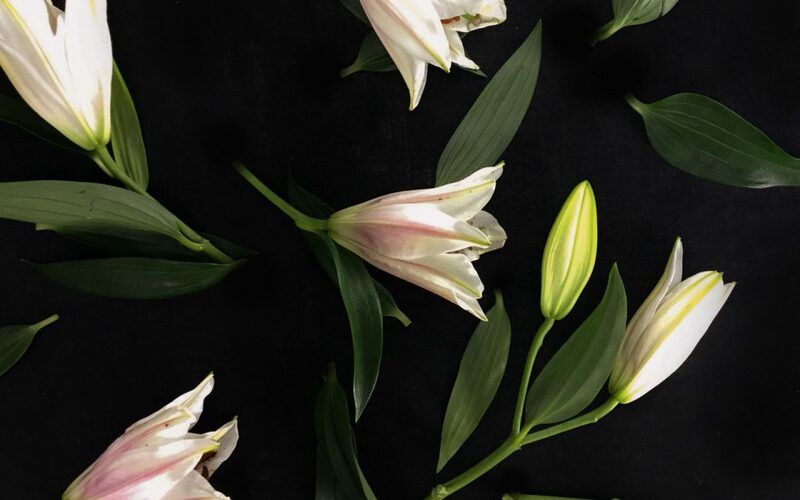 Manipulate the aesthetics of the lilies by cutting off bits and combining pieces together to create new shapes and floral silhouettes. Possibly there are too many leaves, or not enough. Add bits and remove bits to get a beautiful shot. 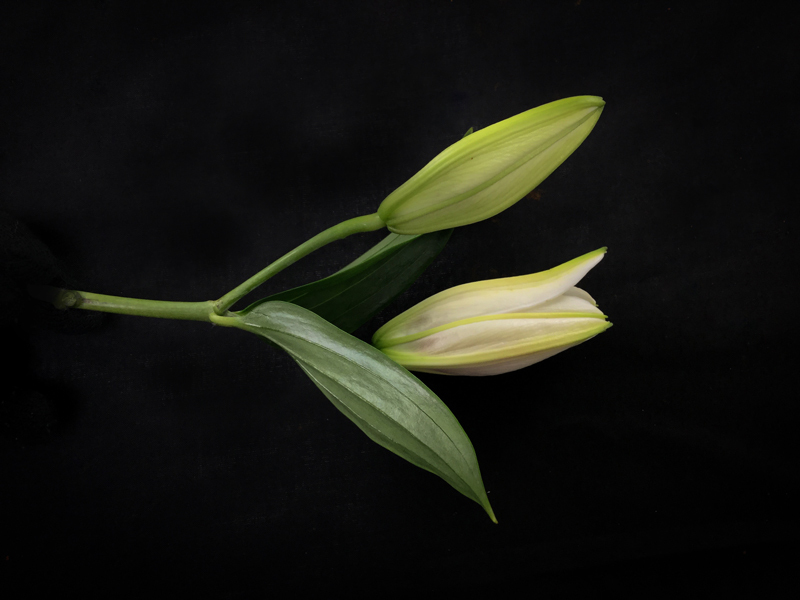 It’s completely up to you how you go about creating your source imagery, but think about all the different aspects or images you can create using different angles of each individual flower. Really think about it and experiment. 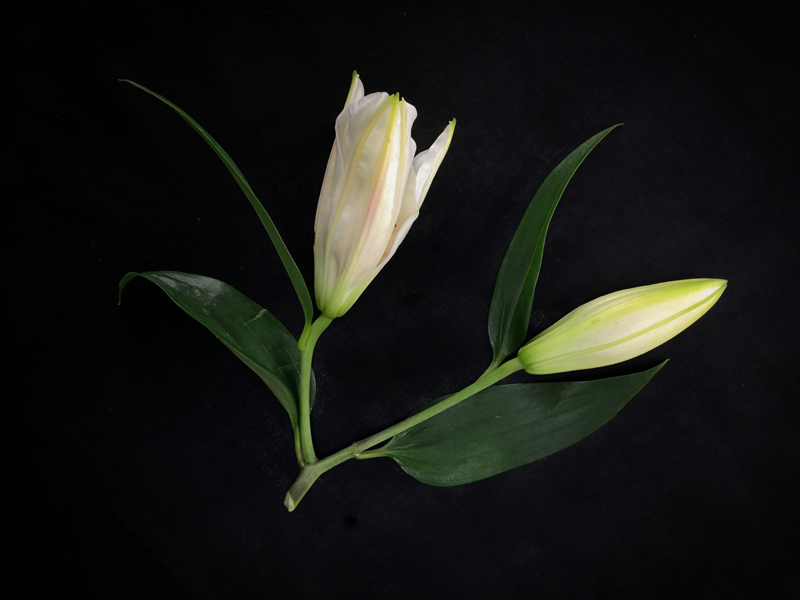 We’re going to take about 100-200 images of our lilies so we have a huge amount to choose from when it comes to building our print. When you’re done, you should have heaps of images to choose from! Below are some of the images that we took. These have been retouched and cleaned up but we won’t discuss that here. Watch the video tutorial to find out more. 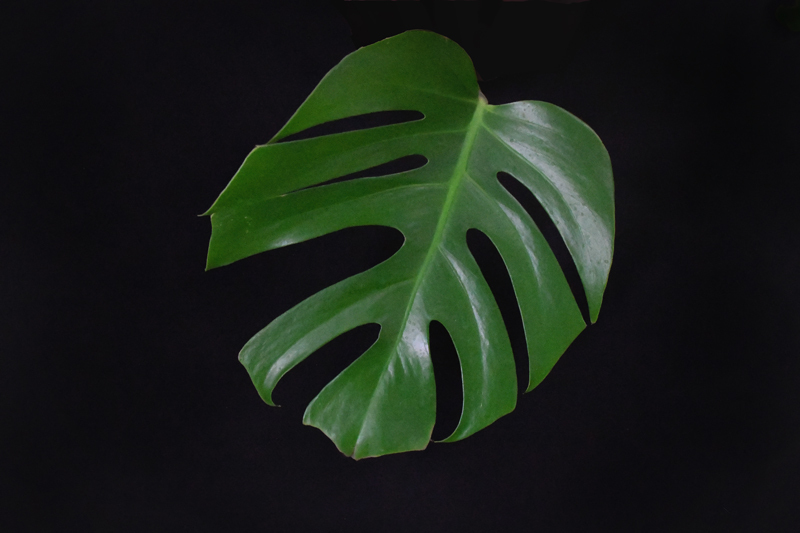 Want to download and use all of our source imagery for your own print projects? Great! click the buttons below to download all the source imagery. The whole archive is around 300MB of data so we’ve split it up into easy to manage packs. 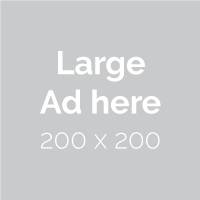 Feel free to use our source imagery royalty free for both personal and commercial projects. All we ask is that you link back to this blog post and spread the word about PatternLab. In the next episode, we’ll start building our gorgeous tropical lily print using our source imagery. We’ll also explain placement prints, full repeat prints, filters, colours and scaling to give you a full understanding of print design techniques that you can apply to your own projects.